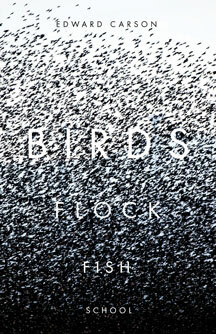 "An immense precision is necessary," announces Edward Carson in Bird Flock Fish School , a collection of poetry that sees language as an example of "emergence," the spontaneous interaction of behaviours by which birds flock and fish travel in schools. These shimmering poems-which attempt to surprise the reader out of familiar ways of understanding nature, mortality, loss and love-articulate a vast, roving philosophical curiosity channelled through urgent form. Using a voice both sophisticated and simple, forged in unadorned couplets tuned to near-hallucinatory clarity, Carson's poems invent a new way of perceiving, a world where "everything unites, at odds with itself." Edward Carson is the author of two previous books of poetry, Scenes  and Taking Shape . Twice winner of the E.J. Pratt Poetry Award, Carson was Writer in Residence for Open Book Toronto in In 2010. He lives in Toronto. 72 pp 8.5" x 5.5"